On Saturday, August 22, three Western Long Island Sound yacht clubs joined forces and created a brand new Long Island Sound sailing event. City Island Yacht Club, Huguenot Yacht Club and Manhasset Bay Yacht Club ran the first annual Western Long Island Sound Governor’s Cup Charity Regatta. Sails For Sustenance, a Florida-based charity that collects and ships used but still useful sails to Haitian fishermen, benefited from sail donations by participants. At the end of the day, two pallets of sails were sent on their way to Florida. 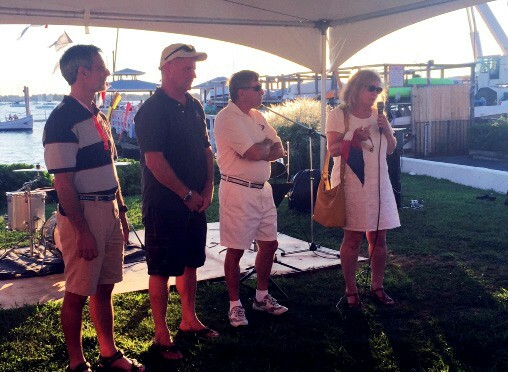 The race was followed by an awards ceremony at City Island Yacht Club, this first year’s regatta host club. The hosting of this annual event will rotate between the three founding clubs. 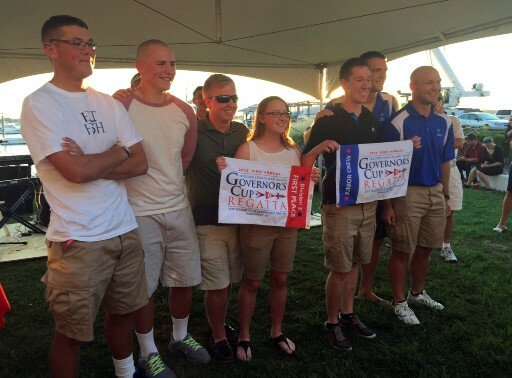 First, second and third place prizes were handed out in the six divisions, as well as a team award and a junior crew award won by a youthful group from the United States Merchant Marine Academy at King’s Point. The first place winners in each division also have the honor of having their boat’s name inscribed on the brand new Walter Cronkite Perpetual Trophy. The tall silver carafe is named for longtime sailor, longtime City Island Yacht Club member, and once “the most trusted man in America,” CBS News anchorman Walter Cronkite. Mr. Cronkite’s daughter Nancy was on hand to help give out the awards and share her childhood memories of sailing out of CIYC. The plan is for the Cronkite trophy to be on display each year at the host yacht club. With the event’s beneficiary chosen, CIYC reached out to Huguenot YC and Manhasset Bay YC and their response was immediate and enthusiastic. “In Huguenot and Manhasset we found willing and able partners who worked as hard as we did to make this all go great,” Bivona enthused. In an effort to make racing more accessible to all, a navigational course was planned rather than windward/leeward. “It’s a way not only to attract very competitive racing boats, but also to bring out sailors who might enjoy a challenging race but normally don’t get involved in windward/leeward events,” said Bivona. The formula worked. All 33 boats signed up as PHRF entries and ratings ranged from -6 to 228 in three spinnaker and three non-spinnaker divisions. Steve Schwartz of Ardsley, NY is the Regatta Chair at City Island Yacht Club in City Island, where he races his Ericson 36 Glory Days.